May has been a busy month for vulnerabilities in the world's most popular desktop operating system. Hackers have made headlines with massive infections by WannaCry ransomware, which exploits an SMB security flaw and the ETERNALBLUE tool. Shortly prior, on May 9, Microsoft fixed CVE-2017-0263, which had made it possible for attackers to gain maximum system privileges on PCs running Windows 10, Windows 8.1, Windows 7, Windows Server 2008, Windows Server 2012, and Windows Server 2016. Vulnerability CVE-2017-0263 had been used already in phishing messages. The emails contained an exploit that first entered the system by taking advantage of incorrect handling of EPS files by Microsoft Office (CVE-2017-0262) and then, once on the inside, leveraged CVE-2017-0263 to get full administrator rights. Two years ago we looked at a similar vulnerability in Windows, and here we will see how the new CVE-2017-0263 opens the way to "pwning" remote workstations and servers. In a word, this is a use-after-free vulnerability (CWE-416)—when context menu windows were closed and the memory occupied by the menu was freed up, the pointer to the freed-up memory was not zeroed out. As a result, the pointer could be reused. The below discussion covers the process of window handling in the win32k.sys driver and how this process makes it possible to exploit the vulnerability. 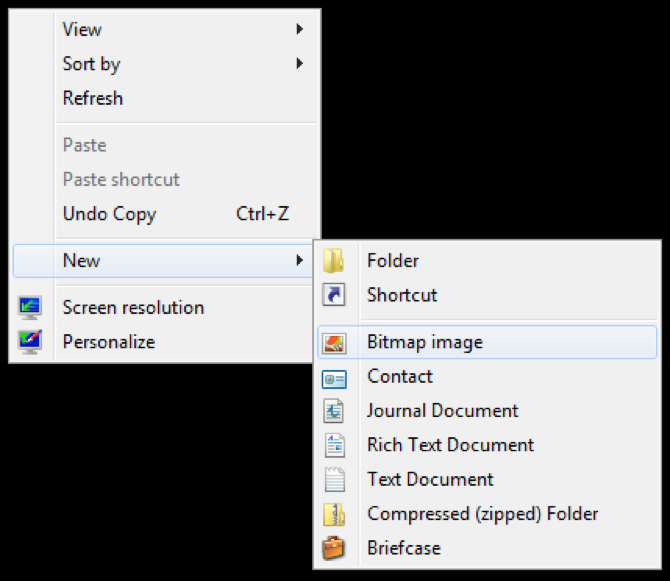 Every Windows user is familiar with context menus. These are the menus that drop down when we right-click. The appearance of this menu and how it is displayed are completely up to the developer of each application. WinAPI provides developers with the TrackPopupMenuEx function, which causes a context menu to appear with the specified parameters at the specified location on the screen. Note that all of the call stacks and structures presented here are taken from Windows 7 x86. The 32-bit OS version is used for convenience: arguments for most functions are stored on the stack and there is no WoW64 layer, which during system calls switches to a 64-bit stack due to which 32-bit stack frames are lost when the call stack is printed. A full list of vulnerable operating systems is given on the Microsoft website. In both structures we have highlighted the fields of interest, which will be used below to describe the exploitation process. Important here is that the gMenuState.pGlobalPopupMenu field is updated only during initialization in the xxxMNAllocMenuState function—it is not zeroed out when the structure is destroyed. This function is the star of our story. Its handful of lines harbor the vulnerability. xxxMNEndMenuState starts with deinitialization and freeing of information related to the context menu. The MNFreePopup function—to which we will return in the following section—is called. The main task of MNFreePopup is to decrement reference counters for windows related to the particular context menu. When the reference count falls to zero, this decrementing can cause the window to be destroyed. As seen above, the flag is discarded and therefore the memory occupied by the pGlobalPopupMenu field is freed up, but the pointer itself is not zeroed out. This causes a dangling pointer, which under certain circumstances can be reused. Immediately after the context menu memory is freed up, the execution flow deletes the references stored in the context menu state structure that relate to clicked windows (uButtonDownHitArea field) when the menu was active or were selected for drag-and-drop (uDraggingHitArea field). A window object in the kernel is described by a tagWND structure. There we describe the concept of kernel callbacks, which will be needed here as well. The number of active references to a window is stored in the cLockObj field of the tagWND structure. Deleting references to a window, as shown in the previous section, can cause the window itself to be destroyed. Before the window is destroyed, a WM_NCDESTROY change-of-window-state message is sent to the window. This means that while xxxMNEndMenuState is running, control can be transferred to user application code—specifically, to the window procedure of the window being destroyed. This happens when no references remain to a window whose pointer is stored in the gMenuState.uButtonDownHitArea field. For example, in the call stack shown above, the WM_NCDESTROY message is handled by the window procedure for the SysShadow window class. Windows of this class are designed to provide shadowing and are usually destroyed together with the windows for which they are shadowing. As described in the previous section, the procedure starts by deinitializing the pGlobalPopupMenu field; this process is performed by the MNFreePopup call, which decrements the reference counters for windows contained in various fields of tagPOPUPMENU. After the prior step, the content of this structure is now controlled by the attacker. So when the described chain of actions is performed, the attacker gets a decrement primitive to an arbitrary kernel address. In this exploit, an address is inserted in the tagPOPUPMENU.spwndPrevPopup field and the primitive is used to decrement the field for flags of one of the windows, causing that window to be marked with the flag bServerSideProc, which means that its window procedure is run in the kernel. As the code shows, immediately after returning from NtUserMNDragLeave, a message is sent to the window by a SendMessage call, causing arbitrary kernel code execution. At this stage, the attacker usually steals a system process token to obtain system privileges. Indeed, this is what happened in the exploit here. What are the salient points of the exploit? The most common cause of vulnerabilities in the win32k.sys library is access to callbacks in user space when any kernel structures are in an intermediate stage when a transaction is changing them. Setting the bServerSideProc flag for a window is also a popular method for kernel code execution. In addition, the most convenient method to leverage kernel code execution for privilege escalation is to copy a reference to a system token. In that sense, the exploit looks rather mundane. At the same time many of the nuances have been simplified or purposefully omitted from this discussion. For example, we did not dwell on the exact appearance of the context menu or menu-related actions that cause the necessary state of the flags and fields of the win32k!gMenuState variable during execution of the xxxMNEndMenuState procedure. Left unmentioned was the fact that the menu names set during SetClassLong calls should, on the one hand, be a Unicode string with no null characters but, on the other hand, be a legitimate tagPOPUPMENU structure. This also means that the address of the window in the kernel (to which the decrement field will refer) must not contain any wchar_t null characters. These are just a few examples from a rather long list. 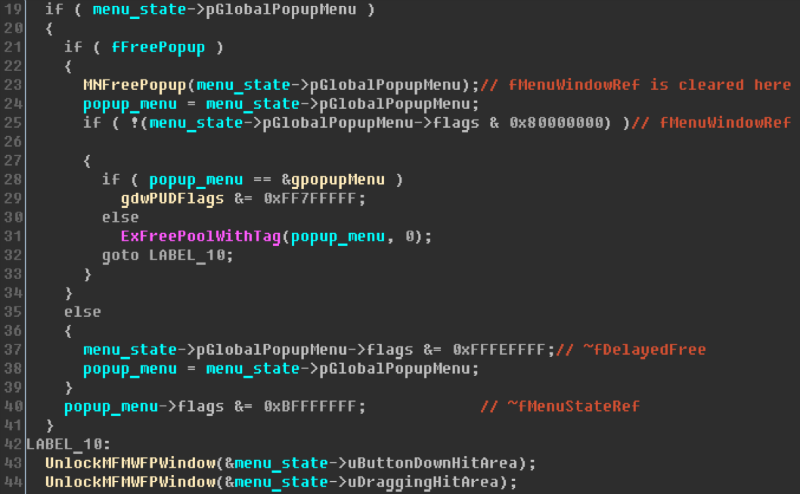 As for the update that fixes the vulnerability, a quick glance shows that the buffer addressed by the gMenuState.pGlobalPopupMenu field is now freed closer to the end of the xxxMNEndMenuState function, much later after the MNFreePopup and UnlockMFMWPWindow calls, and is accompanied by zeroing-out of the pointer. Thus the patch addresses two causes whose simultaneous presence caused the vulnerability to occur.